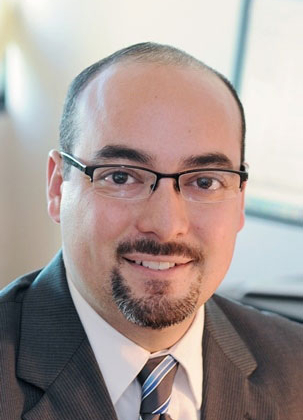 Tomas J. Garcia, an associate at Modrall Sperling, was named “Young Lawyer of the Year 2015” by the New Mexico Defense Lawyers Association (NMDLA) at their annual meeting held at the Hotel Albuquerque on September 25. The Young Lawyer of the Year honor is awarded to attorneys who have not practiced more than five years or are under the age of 36 and have, by their ethical, personal, and professional conduct, shown exemplary achievement in the legal profession, and in doing so have contributed time and expertise to the NMDLA. He joins his Modrall Sperling colleagues, R. E. Thompson (Outstanding Lawyer of the Year, 2010) and Tiffany Roach Martin (Young Lawyer of the Year, 2012) as a recipient of one of the two highest accolades bestowed by the organization. Prior to joining Modrall Sperling, Garcia clerked for the Honorable Charles W. Daniels of the New Mexico Supreme Court; Justice Daniels was selected to present the honor to Garcia. Garcia’s practice includes a variety of commercial, healthcare, torts/personal injury, and natural resources litigation. He serves on the board of directors for the State Bar of New Mexico Young Lawyers Division, the public service arm of the State Bar. He coordinates and regularly participates in service projects, such as drafting wills for emergency first responders, preparing advanced healthcare directives and power-of-attorney documents for low-income senior citizens, and mentoring first-year law students at the University of New Mexico School of Law. Southwest Super Lawyers® selected Tomas as a Southwest Rising Star in 2015.